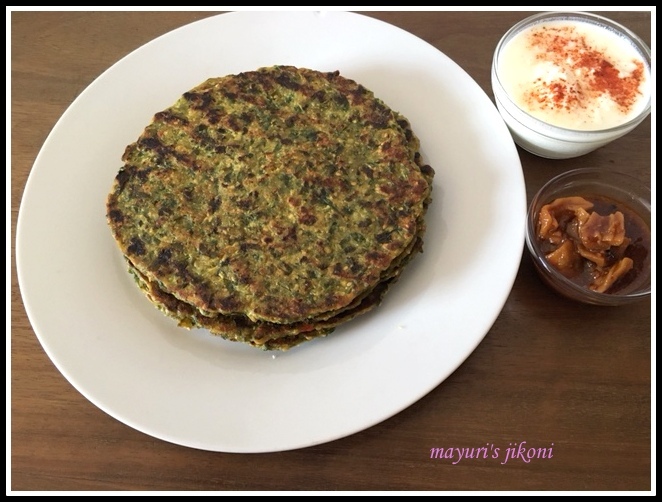 Bajri dhebras (millet parathas) is a common snack for Gujaratis. Train, car, plane, bullock cart or ship, however one travelled, bajri dhebras were carried to have on the way. I remember my mum packing a pile of the dhebras for our train journey to Mombasa. We would take them along for picnics and sometimes instead of handvo had dhebras while watching a movie at the drive-in cinema. The very first time I made bajri dhebras was when I was around 14. My mum had gone to Kericho for a wedding and my grandmother insisted that she wanted to have some dhebras for dinner. I did try and convince her that she could wait till my mum got back but she was pretty adamant. ‘I will teach you how to make them’, she insisted. So under her watchful eye and guidance, I made horrible dhebras. They were shapeless, broken and a few got stuck on the tawa. Basically granny dear walked away with thick, thin, raw, overdone dhebras and I was left to clear the mess I had created in the kitchen. I did not dare to tackle dhebras till I got married. While Nunu would make them, I watched carefully and she would allow me to make the last 2 or 3. Now that she is far away, I have to make them myself as I love dhebras. Millet flour is high in protein and contains all essential amino acids. It is rich in folate, potassium, magnesium, copper, zinc, Vitamin E and B complex. It is rich in calcium and iron too. Millet helps to maintain cardio vascular health and helps reduce acidity problems. Millet flour is readily available at the Indian Grocery stores and the fenugreek is available at the Indian greengrocers. Sieve the flours together into a big bowl. Add oil, sugar, salt, turmeric powder, carom seeds, sesame seeds, ginger, garlic and chilli paste to it. Mix well with your fingers. Add the finely chopped fenugreek. Using the yogurt, form the flour mixture into a soft dough. Cover the dough with a lid or cling film and let it rest for 15 to 20 minutes. Put the tawa or frying pan on low heat. Take a chopping board or the one you use for rolling parathas. Take a small clean cotton cloth ( I use a ladies handkerchief) and rinse it under a tap. Squeeze out the water. Dampen the board with little water and lay the cloth over the board. Wet your hands in the bowl of water. Take a golf ball size of the dough, roll it into a ball and place it on the damp cloth. Wet your fingers again, and start patting the dough till you have a circle of nearly 6 to 7 inches in diameter. In between you may need to wet your fingers so that the dough does not stick to your fingers. Take a teaspoon ful of oil and smear it over the hot tawa. I usually like to rub the oil all over the tawa with a kitchen towel. Take the two corners (the ones away from you) of the cloth and quickly place it on the tawa with the dough side down. Let the dhebra cook on the underside for 2 to 3 minutes. Flip it over and let it cook for a minute or so. Smear oil on top and around it (about a teaspoonful). Cook both sides till brown specks appear. Place the debhra on a wire rack to cool. Dampen the cloth again and repeat steps 7 to 15 again till all the dough is finished. Serve dhebras with hot masala tea or yogurt or with pickles of your choice. If you feel working with the cloth will be difficult then form the dough using ¼ cup yogurt. The dough will be slightly stiff. Oil 2 cling film pieces. Place on on the oiled board and place the dough on it. Cover with the other cling film. Roll gently using a rolling pin. Peel away the top cling film.Wet your hand. Place your hand wide open over the rolled dough. Flip it over onto your hand, peel away the cling film and place the rolled dough on the tawa. Work with smaller size rolled debhras initially. My first debhra tends to stick to the tawa. Make a small wheat flour paratha or fry a bread slice on the tawa before you start making dhebras on it. Some families use jaggery and tamarind pulp instead of sugar and yogurt. Heat ½ cup water. Add to it 2 tbsp of tamarind pulp and 4 tbsps of grated jaggery. Let the jaggery melt and the water cool down before forming the dough. Can use less sugar or jaggery if you want. Do not use high heat as the debhras will get burnt. If the tawa becomes cool just let it become hot over low heat again. This is really a very nice and helpful post thanks for posting this.Its certainly very informative to read.